Clean Seas Tuna (CST) is moving to the capacity for a 5,000 ton per annum sustainable Yellowtail Kingfish (YTK) business by 2020. To underpin this growth in the YTK industry it is critical that the hatchery production efficiency and quality of fingerlings produced are improved. 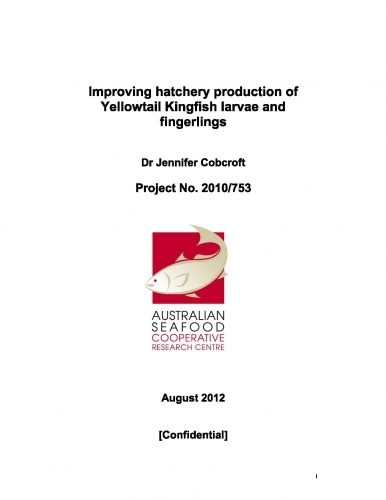 Three significant issues were identified in YTK larval rearing that presented bottlenecks to hatchery production efficiency. These included low survival rates, low swim bladder inflation rates and high rates of jaw deformity. This project addressed all three issues, with a focus on applying results from previous research at medium and commercial-scales (light intensity and quality, and temperature, live feed regimes) and investigating larval nutrition and photoperiod at a small-scale.